Isolate your sound, not yourself! Essential whenever or wherever you're unable to crank full performance volume and tone. The concept is simple. A speaker is mounted in a completely closed, hinged cabinet with a microphone suspended inside. The cab has 1/4" in and outs, as well as a mic out to the mixing console. 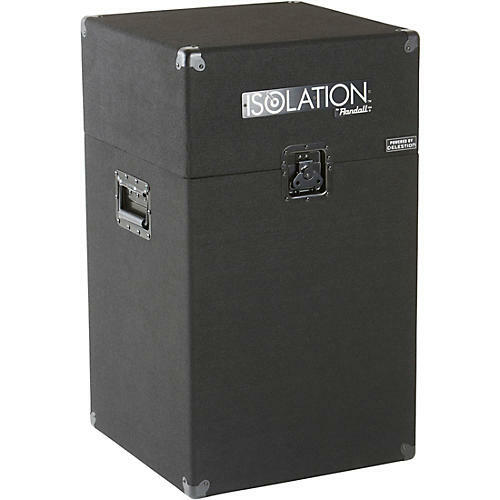 For recording, Isolation lets you record your amp full out, reflecting your true tone without waking the neighbors or inspiring visits from the cops. 12" Celestion Vintage 30 speaker. 18"W x 18"H x 31-1/2"D.
How to use it: Simply plug your 8 ohm speaker output from any amplifier source into the 1/4" speaker in/out of the ISO. With the top lid or rear compartment door open, tailor your sound as you would with any cabinet. (Note that the Vintage 30 Celestion is 60 watts so be aware that it cannot handle the same power as a 4x12 full of them). Next, close the lid or rear compartment and secure the latches. Now, plug a standard XLR cable into the XLR output and connect to any source that accepts XLR mic level. This can be anything from a channel input of the PA system to the smallest USB interface for recording. Finally, adjust for optimum level and you are done. Remember that there is no such thing as total silence, but the ISO cab approach eliminates most of the sound coming from speaker and allows use of loud amplifiers for home recording in situations where you can't blast and "Silent Stage" situations in which many players are forced to degrade their experience by using digital modeling products.